1xBet is a popular operator in Nigeria offering exceptional services to its mobile customers and a great 1xBet app. This review is all about the 1xBet mobile app and the details you need to know if you are a fan of online sports betting and playing while on the go. In the table below, you will find a brief overview of the bookmaker’s rating in key areas, including system requirements, features, bonuses, and more. The 1xBet mobile app is available for Android and iOS users. Below are the instructions to help download the 1xBet app on your phone or another portable device. Visit the 1xBet desktop platform and find the downloadable 1xBet apk file. Download the apk file and tap the file to give permission to initiate the installation process. At this time, your Android phone or tablet will display a pop-up that will prevent you from downloading the 1xBet mobile app. Go to “Settings” and then “Security”. Tap on “Device Administration” and then tick the option that reads “Unknown Sources”. This will enable the installation of the 1xBet app, which does not come from the Google Store itself. For iPhone and iPad owners, this procedure will take a bit longer to complete. Go to your phone’s “Settings”. Tap on your Apple ID and head to “Country/Region”. Select the country you live in and confirm. Alternatively, you can go to the operator’s mobile site and scroll all the way down to find the “Mobile Applications” section. Enter it and tap on “Download app for iOS”. Don’t forget to accept the terms and conditions by taping next to the corresponding box. Note: You may also download the 1xBet Casino, Vega, Bingo, and Poker apps too. Android users may download the 1xBet app with a device compatible with Android 4.4 or higher while iOS operating systems need to be, at least, iOS 9.3 (compatible with iPhones, iPads, and iPods). You can use the 1xBet app to claim the operator’s 200% first-deposit bonus. To do that you will need to register first. Start by tapping on the “Register” button, then fill out the required details, confirming, and make a qualifying deposit. Just bear in mind that you can further benefit from the bonus with a 1xBet promo code too. The 1xBet app is a complete replica of the desktop version, and offers a wide range of services and features, including live betting and live streaming, which enable punters to bet on their favourite team while the match is still playing and watch an available game on screen live respectively. Players can also view lists of upcoming and ongoing events, and are even able to adjust their betting sum through just one tap. One of the most popular and, at the same time, unique functions is that of Toto bets that enable punters to place their wagers on Toto 15, Toto Football, and Toto correct score. Finally, the 1xBet app gives the chance bet on TV games too. The section below includes some of the most frequently asked questions about the 1xBet app. Tap on “Live”or “Sports” in the main menu. Select the sport and event of your likes (look at the left-hand column). If you are going to place different bets on the bet slip, select the desired bet type (Chain, System or Accumulator). Enter the amount you wish to deposit as stake. Tap on “Place a bet”. The 1xBet mobile app hosts several funding options to make a deposit. Below is how to make a deposit via the four primary payment options. Visit the “Recommended Methods” section under “Account”. Insert the amount you wish to deposit. Tap “Confirm”; then “Make Payment”. If you have used GlobalPay, you will need to fill out your card details. Then, you will be sent a safe token to both your phone and email. Insert the token in the pop-up screen and hit “Confirm”. These steps are the same with VERVE funding method too. With deposits made with CASENVOY, the procedure is the same up to step#4. Then, you will need to choose between Casenvoy Linked Cards or Casenvoy Account, tap “Continue”, and insert your email and password so the transaction can be confirmed. With GTPay, you go all the way up to step #3, then insert your email in the pop-up screen, click “Continue”, and log in to your GTPay Mobile money account. Enter your email again and tap “Continue”. Tap the “Withdraw” button under “Account”. Select the funding option of your likes. Enter your account or phone number. Fill out the desired amount you wish to withdraw. You will receive a confirmation code for your transaction. The fastest way to get in touch with a customer support agent via your mobile phone is the live chat feature or the call-back function. Alternatively, you could email or call them. The 1xBet mobile app features the same functions of the desktop version, including live streaming and live betting while allowing players to place the operator-exclusive Toto bets. 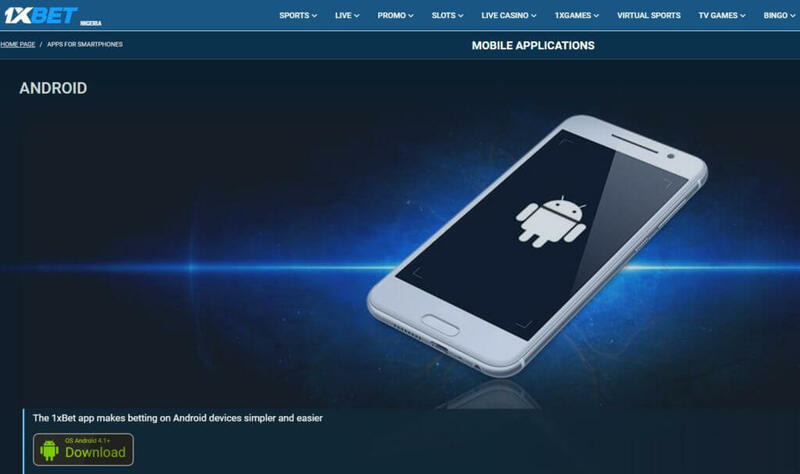 Besides, the fully-functional and well-designed layout and user-friendly interface ensure that all users can enjoy the 1xBet experience, whether owning an Android or iOS-powered mobile device. Finally, punters can access the 1xBet mobile app and claim the welcome bonus and a long list of other promos currently available on the platform. And, in case of a query, the 1xBet mobile app enables them to receive fast replies via live chat. Click the following button to enjoy the welcome bonus.